When I was younger, maybe eleven or twelve, my friends and I were obsessed with gel pens. They were pens (obviously) that came in an array of colours, anything from pastel yellow to metallic green. We used to love writing with them at school - and even drawing on our skin with them. Our favourite thing about them, though, was that you could get scented ones. Grapes, bananas, apples...they had them all. We'd sniff these like they were crack. So you can imagine my excitement when I was in my local Boots the other day and spotted some of Revlon's scented nail polishes. I've never actually seen them in there before. They only had three colours/scents, Grapefruit Fizz (pink), Grape Fizz (purple) and Watermelon Fizz (red). I bought the first two, because I need another red nail polish like I need a hole in the head. I've used scented nail polishes before (more on that in another post) but they usual smell disgusting and make me feel nauseous. I've heard such great things about Revlon's scented polishes, however, that I decided to take a chance on them. Am I glad I did? Read on to find out. The one I'm showing you today is Grapefruit Fizz. 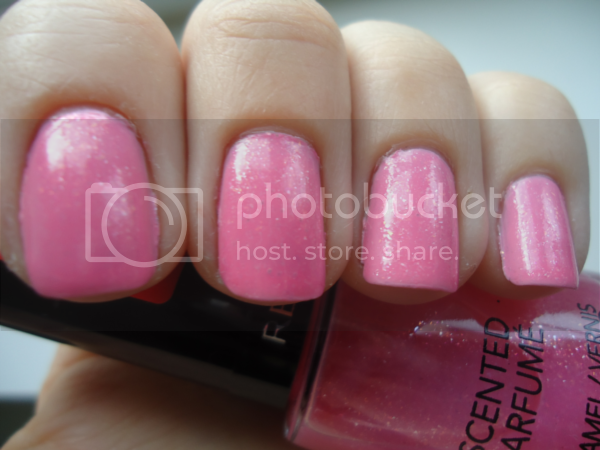 It's a Barbie pink polish with large glass flecks. I could tell just from looking at the bottle that it was going to be very sheer, so I layered it over a coat of Models Own Baby Pink, which is, erm, a baby pink polish. Baby Pink is a bit paler than Grapefruit Fizz, but it's the closest match I own. I then did two coats of Grapefruit Fizz. The formula was so-so, a little thin perhaps, and I did have a bit of pooling on the cuticles. I immediately sniffed my nails afterwards (good thing I did it in the privacy of my bedroom or I would've looked really weird!). To be honest it smells more like a poor imitation of grapefruit than the real thing, but it's not an unpleasant smell. It's just generically fruity. Yup, it's veeeeery pink. Perhaps a bit too pink for my tastes, but oh well. I put a coat of Seche Vite over the top for these photos, and I was surprised to find I could still smell the grapefruit afterwards. The scent lasted about two days before it faded completely - it would probably last longer if I hadn't used a top coat. I thought these polishes were new for Spring 2012, but I've had a little look at some other sites and apparently these have been out since last year! They seem to be new to the UK, anyway, so you can probably find them in your nearest Boots right now. They're £6.49 each, but Boots has an offer on at the moment where you can buy two Revlon lip/nail products for £10.